The first season of Amazon Prime’s The Tick was mostly enjoyable, but spent a little too much time getting things into gear. Early episodes put a lot of emphasis on Arthur’s neuroticism (as well as The Tick’s obliviousness), and while it was often rewarding to watch our reluctant hero confront his insecurities, it was reasonable to wonder when things were going to move to the next level. Thankfully, the season ended on a strong note, with lots of action and plot twists, giving viewers plenty to be excited about for a potential second season. Over a year later, that second season has arrived, and it more than lives up to its promise—this is the show we were hoping The Tick could be all along. 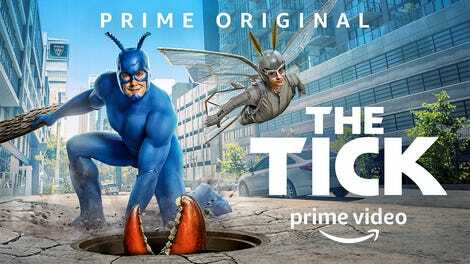 Season two begins just after the end of season one, when Arthur and The Tick finally took down The Terror, after proving that he was still alive in the first place. Viewed as national heroes, they catch the attention of A.E.G.I.S., the government-run superhero organization we heard quite a bit about—but rarely saw—in season one. The scenes at A.E.G.I.S. are quite enjoyable, from Marc Kudisch’s performance as the R. Lee Ermey-esque Tyrannosaurus Rathbone, the hard-nosed stubborn leader of the group, to John Hodgman’s role as Doctor-Agent Hobbes, the deadpan, mysterious scientist who leads Arthur and Tick through the facilities. These scenes continue the serious-yet-light vibe that defined the first season, and set things on an appropriate track. After their escapade stopping The Terror, Tick and Arthur get the chance to be superheroes. Unfortunately, that involves extensive testing for “super-ness,” which Arthur fails miserably at, bombing a series of tests in scenes that are a little depressing, but mostly funny. 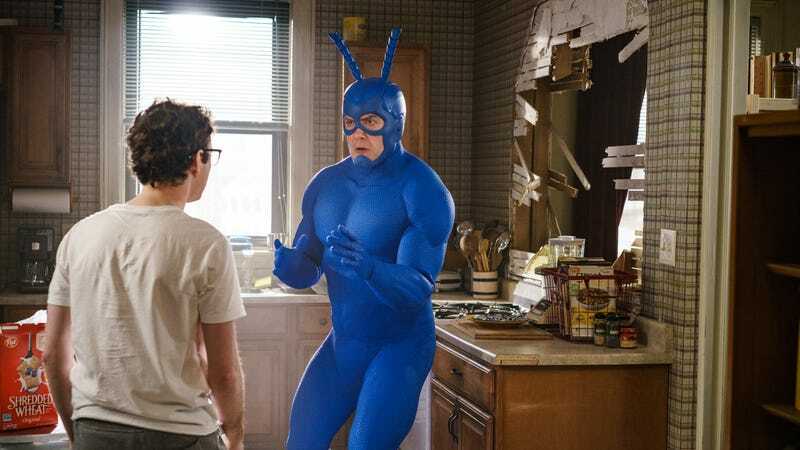 Despite a lack of powers, Arthur’s proximity to The Tick allows him to register as a superhero, since the government believes he can help control him. From there, Arthur and Tick take on the case of New York’s latest villain, the confusingly named Lobstercules (Niko Nedyalkov). Ever self-aware, the show makes plenty of jokes about just how ridiculous this name is. Silly or not, it still sets up plenty of drama and plot twists along the way. While Arthur and The Tick are the toast of the town, things aren’t going so well for Superian (Brendan Hines). For years, he assured everyone that The Terror was dead. As such, people have lost their trust in him, and have begun leaving negative comments on social media. Worse yet, a paranoid, Glenn Beck/Alex Jones/Jim Cramer-style commentator named E. Morgan Pearl (Tom O’Keefe) goes on a series of televised rants against him. Massive egomaniac that he is, Superian simply cannot handle this and goes into a major meltdown. Arthur tries to help, but despite offering mostly sensible advice, Superian interprets everything in the worst way possible, and continues to compound his own problems. More than ever, Superian appears to be a stand-in for the egotism of Marvel superheroes like Tony Stark and Doctor Strange; his utter uselessness after being taken down a peg really drives the point home. One of the best parts of last season was Yara Martinez’s thrilling performance as Miss Lint, a.k.a. Janet, a.k.a. Paloma, a supervillain who was often sympathetic, as she worked to prove herself in the face of male skepticism. Lint is also one of the most fascinating characters in the second season, as she grasps for power in ways that will continue to throw off viewers. Along with her regular henchman, Frank, she gets a teenage, computer-savvy sidekick whose name is literally Edgelord—perhaps a bit on the nose, but it’s also one of the funniest jokes of the season. He’s every bit as pretentious and obnoxious as that name would suggest, but to his credit, he is indeed useful in helping Lint with her plans, which honestly works better than if he had simply existed as an irritant. One of season two’s biggest strengths is a deftness in introducing new characters, particularly new heroes—if it gets renewed for a third season, it’ll be fascinating to see who else joins the fray. At A.E.G.I.S., Tick and Arthur meet several fascinating characters like Flexon (Steven Ogg), a retired hero who still works as an attorney, as well as Sage and BronzeStar, who also play crucial roles as the series unfolds. The heroes we see here have the same offbeat look and vibe that give the show its considerable charm. As for Tick and Arthur themselves, their character development continues to be rewarding. We still don’t know much about Tick’s origin story, though it’s still joked about, but he becomes wiser, to the point where his usual gibberish morphs into genuine profundity. Meanwhile, Arthur is still his nebbishy self, but he’s far more confident, as he even gains the courage to put Superian in his place. As with last season, the tension between Arthur and his sister, Dot (Valorie Curry), plays a main role, as each character is a little too over-protective of the other one. Throughout season two, however, they learn to trust each other more, and the evolution of their relationship is incredibly rewarding. Elsewhere, the appropriately named Overkill (Scott Speiser) returns, as brooding as ever, and continues his friendship/budding romance with Dot. Those who enjoyed Alan Tudyk’s performance as the gloriously absurd Dangerboat will be happy to know the character is back, and as off-kilter as ever. It’s not all farce, however, as we also learn about his tragic past, and the beginnings of his friendship with Overkill. It’s a testament to this show’s writing and character development that it can wring character development and catharsis from something as absurd as Dangerboat. The Tick has genuine heart through every bit of its ridiculousness, and that’s what makes it so worthwhile. The first season of The Tick was a fine introduction to its main characters, and showed us what it could be. Here, it lives up to its true potential as a show that has the perfect mix of absurd humor and cathartic storytelling. Arthur has evolved to the point where he can believably be seen as a hero, while the wisdom buried within The Tick’s nonsense has risen to the top. Anyone who thought the initial season of The Tick was good but mildly underwhelming will find quite a bit to like here. After years of people trying to tell this story and either failing entirely or succeeding when no one was looking (see the criminally overlooked 2001 series), this feels like the iteration of The Tick we’ve all been waiting for.